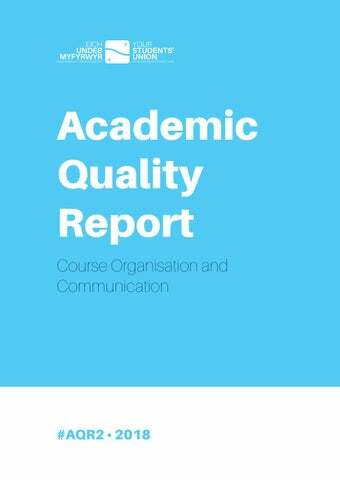 Introduction We are pleased to present our second annual Academic Quality Report. This year the Students’ Union has decided to focus on the topic of course organisation and communication. These areas have been identified for this piece of work as they regularly score lower in a number of student surveys and feature regularly in comments from course and faculty reps, and in emerging trends from the Union’s academic case work. Our intention in presenting this information is to assist the University in identifying areas for improvement as part of our role as a critical friend. We are highlighting these areas as we believe that addressing them will result in improved student satisfaction. These topics are broad and cover a number of areas that directly impact on students’ academic experience. They cover timetabling, communication, later teaching hours, module availability and issues related to placement students and distance learners. The National Union of Students argues that effective course organisation is fundamental to student satisfaction and a positive student experience. Universities UK1 state that it is the main reason students have for not being satisfied with their student experience. We present this report to the University for consideration and anticipate continued engagement on the issues and recommendations outlined within. Our experience of the AQR project to date is that is has strengthened the relationship between the University and the Students’ Union and we look forward to working in partnership with the University on these areas over the coming year. AQR1 Outcomes Last academic year the Students’ Union presented the first of our Annual Quality Reports (AQR) to University Senate on the theme of ‘additional costs’. This was our first AQR and as such we have been exceptionally pleased by the response, both within the institution and externally. We were excited to be nominated for and win the NUS UK and NUS Wales Education Awards for the project, but most importantly, this project provides a base from which we can establish and track matters of importance to students, their learning experience and future success. The escalating costs of study remain a challenge for students at UWTSD and beyond and we are pleased that the University has recognised the issues outlined in our report and has taken action. Before moving on to the topics for our second AQR, we wish to reflect and respond to the work done by the University on the recommendations included in AQR One. Included below is a reminder of our recommendations in relation to additional costs, the University’s response to those recommendations (as submitted to Senate), and our comments which recognise progress to date and highlight where additional work may be necessary. The University should make adjustments to its promotional material making clear the general additional costs students will incur as part of their studies. University Response Promotional materials now contain information and are fully compliant with CMA guidance. A general cost of study statement has been prepared that advises students of standard costs (e.g. laptops) as well as advising students of student of offers in place such as Tech Over Time that enable them to access academic resources more affordably. http://www.uwtsd.ac.uk/apply/terms/ Information on additional offers etc. 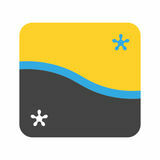 was included in all welcome packs as well as in the UWTSD student app which was developed for welcome this year. These were also outlined in induction resources produced for in class induction on the staff induction and welcome share-point pages. Studentsâ&#x20AC;&#x2122; Union Comments We welcome the general additional costs statement provided on the website. We do, however, believe it would be best if a link to the statement would be provided on the main page of the fees website: http://www.uwtsd.ac.uk/finance/tuition-fees/. We also welcome the inclusion of a statement regarding additional costs on the Terms and Conditions for applicants. The University has done a great deal of promotion on relevant offers for students and on how to access financial support, we think that it would be beneficial if these linked into the additional costs statement, as at present they are separate. Additionally, the University should ensure that promotional material at programme level draws students’ attention to any additional costs associated with academic-related activities. This should include mention of the need for specialist equipment, travel costs, or any costs from the general list that are likely to be higher than for the average student. University Response Promotional materials now contain information and are fully compliant with CMA guidance. Information on a range of programme pages includes information on the additional cost associated with a programme. Further action needed re: the remaining set of programmes. Students’ Union Comments We recognise that much progress has been made and that the majority of programmes now contain the ‘additional costs’ statement. We have completed an audit of all UWTSD programme web-pages and we found that some programmes still do not contain the general statement. These programmes are listed in Appendix 1 – Programmes Lacking Statements. Currently these programmes represent every faculty and most schools, and it seems some programmes newly added to the website, including yet to be validated programmes, do not include them. There are some areas of the University where we could find no evidence of additional costs statements, including courses run out of the London campus, those on the Cardiff campuses, and many post-graduate courses. We have anticipated that the website may be incorrect and may be displaying old programmes, regardless this merits tidying up for the sake of completeness. That the University should specify and assess ‘additional course costs’ as part of the module development process, and that this should be included and discussed within the cycle of programme development and review. University Response This has been embedded within validation of programmes processes. Students’ Union Comments We are pleased to see the inclusion of additional course costs on the PV16 and PV16a validation forms and have been further encouraged by the subsequent discussion of associated costs at AQSC. We note the recent discussion at AQSC about the practicalities of ensuring that this information is considered and captured in the validation process and reviewed regularly. We believe that it may be useful for the University to consider adding a line about ‘additional costs’ in chapter four of the Academic Quality Handbook. That the University investigates its current offering of bursaries and looks to increase and widen current offerings, especially by targeting students studying courses which carry particularly high associated costs. University Response For 2017/18 the university has doubled the amount available for the Educational Bursary to ÂŁ200. A new vocational courses bursary of up to ÂŁ200 has been introduced. The bursary package for 2018/19 has been fully reviewed and the SU has been fully consulted as part of this review process. Studentsâ&#x20AC;&#x2122; Union Comments We are delighted to see the development of the bursaries as described above, and particularly pleased with the creation of the new vocational courses bursary. We were fully engaged in the process of reviewing the bursaries and would like to commend the University for the approach taken as we feel that in particular the development of bursaries by Faculty both addresses the issues we previously raised and makes the package much more understandable for students. University Response A new vocational courses bursary of up to ÂŁ200 has been introduced. Further tailor made solutions have been agreed as part of the 2018/19 bursary review process. Fully review the current associated costs of study faced by students, using the HEFCW categorisation. University Response This is ongoing and although this has been completed on a programme level (see website) and is systematically done for new programmes (see validation processes) a review has not been completed yet. The aim is to complete this before the start of 2018/19. Studentsâ&#x20AC;&#x2122; Union Comments The main thing for us is that students understand what an essential costs are and what may be optional. From what we can see publically we donâ&#x20AC;&#x2122;t see evidence that the University have used the three recommended HEFCW categories (Mandatory; Necessarily Incurred & Optional). Weâ&#x20AC;&#x2122;re not sure that the application of these categories is strictly necessary as some of the published additional cost statements are very good and detailed. It may be beneficial for the University to ensure that there is consistency across its programmes, in which case we would recommend that these categories are applied. If they are to be adopted then it would be beneficial for these to be explained to students within the general cost of study statement. Develop an action plan in concert with the Students’ Union on how best to ensure the burden of these costs is most equitably shared. University Response Request an action plan model from the Students’ Union to be presented at the first Corporate Policy Committee of the 2017-2018 academic year defining the parameters of the action plan. CPC to approve and monitor the action plan. Students’ Union Comments We will be happy to work with the University on an action-plan template once the University’s review of the current associated costs of study has been completed (as per recommendation 3a) and all of the information is available for consideration and review. Add a link to the additional costs statement to the main page of the fees website (http://www.uwtsd.ac.uk/finance/tuition-fees/). Add information/links on relevant offers for students and on how to access financial support to the additional costs statement. Review appendix one and ensure that all programmes display additional costs information. Consider adding a line about â&#x20AC;&#x2DC;additional costsâ&#x20AC;&#x2122; in chapter four of the Academic Quality Handbook. Complete the review of additional / associated costs. Consider adopting the HEFCW categorisation as standard. how well organised and smooth running the course is, how efficient the timetable is, and how well course changes have been communicated to the students. Before we look at these areas in more detail we would like to make it clear that when students were asked what they think is good and what needs improvement, the most pronounced difference was between individuals and processes. Students were most positive about interactions with actual people. Whether it was referring to their lecturers’ knowledge, the accessibility and support from tutors and Student Services staff, or the actual academic content provided by lecturers, students were positive. This is very much in line with feedback gathered though sector surveys and awards such as ‘What Uni’. Our research was informed by a literature review, an online bilingual survey widely disseminated which was filled in by 223 UWTSD students, academic case-work review, feedback from student representatives and some small scale focus groups. Results: Demographics Respondents were based across largely across the Swansea, Lampeter and Carmarthen sites, with a small number of responses from London and Cardiff. Swansea made up the bulk of the responses on 45% with Lampeter the next highest on 30% and Carmarthen at 22%. There is a slight over representation of students based in Lampeter, but nothing concerning. Responses were received from every school, with the Faculty break down being – Yr Athrofa (FEC) – 23%2 Faculty of Architecture, Computing and Engineering (FACE) – 16% Faculty of Art and Design (FAD) – 10% Faculty of Business and Management (FBM) – 18% Faculty of Humanities and Performing Arts (FHPA) – 33% The majority of responses (80%) were from undergraduate students, though we had responses from students studying at every level (though in some cases low numbers). The majority of respondents were female, slightly over a 2:1 ratio. More than 55% of respondents were 18-21, with progressively lower numbers as age increased, though over 6% of respondents were over 50. 87% of respondents identified as white, 6% Asian or Asian British with the rest of respondents split. 90% reported as being UK students with an equal split between EU and non-EU international students. 85% of respondents did not report being carers, with more than 10% reporting as primary carers of children, about 5% as carers of disabled adults and 3 respondents stated they were a primary carer of someone aged over 65. The questions were promoted and presented bilingually, with responses received in both languages. Overall, we are satisfied that this is a relatively accurate representation of the student cohort at UWTSD. One issue to note that as this is a self-selecting survey promoted via the Students’ Union, there will be a higher response rate from students more involved with the SU (for example Course Reps and those that have received SU support during appeals or complaints). Outcomes The first question students were asked was, “Overall, how organised would you say your course is?” with a 1-5 Likert scale for responses. The overall score for this was 3.07 which we believe would equate to slightly lower that the University’s current NSS score for both the overall Organisation and Management section and Q15 on course organisation. There is some considerable variation by Faculty when we look at the scores more closely. For the majority of questions, the campus data doesn’t reveal much in the way of differences or useful insight. However, it’s quite useful at this point to consider campus on this broad introductory question as it reveals a range of opinions. This range of scores is interesting from a comparative point of view between Faculties, and also interesting to illustrate differences between campuses where Faculties span more than one location. Much like the NSS, we believe that this general question is difficult to link to tangible aspects of course organisation, although it is useful to highlight general impression. Overall impression of course organisation illustrates a mixed picture between Faculties and, where relevant, between the sites within faculties. No general trend by campus emerges from this question, but this analysis may assist some faculties in identifying differences in student experiences. The following sections aim to summarise our findings for each of the topics we have considered. Course organisation is complex and we have found no ‘silver bullet’ to report as the one change that the University should make to improve student satisfaction. In each section we will summarise our findings, share relevant feedback, and make a recommendation for consideration. In order to keep this report focused and manageable we will only summarise each theme but we have collected a wealth of data which we would be happy to share with faculties and relevant departments in order to enable further discussion and inform future work. Timetabling and lecture changes (45% selected) Assessments information and deadlines (22%) Information on bursaries (10%), and Other module changes (7%). These issues were fairly equally reflected across the Faculties. Students from every faculty picked lecture and timetable changes as the most important. The open comments revealed several main trends which are applicable across the University. The first area relates to e-mail correspondence where students raised issue with both the amount of communication received from the University and the relevance of that information. Common complaints were that important e-mails were being lost within a volume of e-mails which they perceive to be less relevant. The other main trend related to the timing of time-sensitive communication. A common complaint from students is that they reported often receiving important information regarding placements, lecture changes and assignments late in the afternoon, leaving them unable to raise issues with the content or ask follow up questions immediately. One such respondent reported receiving emails about a placement at 5pm on a Friday when it was due to start the next Monday, leaving no time to clarify the arrangements or make alternative plans. More than three quarters of students reported that they had had last minute changes made to their course. In the comments, these focussed on changes to lecture times and rooms. Whilst there was recognition that often these changes are unavoidable, there was considerable disquiet with the manner in which some of these changes were made. Many reported that these changes were only announced an hour or two before class, and in some cases the changes were posted on the door or board of the classroom. We welcome the new Cancelled, Postponed and Rescheduled Class Policy and are hopeful that this policy has the desired impact. Recommendations Both of the trends above may be perception rather than fact and we suspect that these are illustrative of student behaviour around the use of e-mail. Students do not use e-mail in the same way as staff and it may be unrealistic to expect students to be checking their e-mail every day. What is clear is that students see the volume of e-mail traffic as a barrier to effective communication. This is a difficult area to address as what is useful and essential information to one person is irrelevant to another. The only sensible recommendation that we can make is to advise that the University seeks to use a different communication tool to e-mail for the transmission of the most important messages to students, i.e. the four areas we have highlighted above. That the implementation of the new Cancelled, Postponed and Rescheduled Class Policy is regularly monitored for effectiveness and consistency. Timetabling Timetabling has long been a concern raised with the Students’ Union from course reps and other students. Asked to rate their satisfaction with how quickly they received their timetable on a Likert scale of 1 to 5, the overall score was 2.87. Overall, this is not a positive picture with less than half of students rating the University in the top 2 quintiles, with more scoring in the bottom 2 quintiles combined than in the top two. That the University commit to issuing accurate timetables to all students at least a week before teaching starts in each term, and that this commitment is added to the student charter, monitored and reported to the appropriate University committee. Regarding the breadth of module choice, students in general were much more satisfied. Where lower scores exist, these are mitigated somewhat by comments which suggest that a lack of choice is more due to a low number of students wanting to do modules, rather than a lack of overall choice. As a trend, students are satisfied with their module choice and we have no recommendations to make in this area. We have collected a number of very specific comments from students in the Faculty of Humanities and Performing Arts and we will share those with relevant Faculty staff for their consideration. In terms of the timetabling of assignment deadlines, students were broadly positive and the general trend reflected that that students believe that sufficient time is provided between assignments being issued and the deadlines. In terms of the students who were dissatisfied there were two seemingly contradictory trends: students on programmes with a concentrated period of deadlines indicated a preference for them to be spaced out; and students who had deadlines which were regularly spaced expressed a preference for deadlines to be moved as late in the term as possible. Given the findings in this area, we have no specific recommendations to make although the Studentsâ&#x20AC;&#x2122; Unionâ&#x20AC;&#x2122;s position on deadlines has consistently been that there should be sufficient time for students to receive and consider feedback between assignments. One student reported that they had faced significant delays in enrolling because the system required them to choose 120 credits of modules before they could finish enrolment, despite them only needing to be signed up to do a 40 credit dissertation module. Resolution to this problem left the student walking bits of paper between Registry, Finance, Student Services and their Faculty. Another student reported a number of lost documents (including Passport and DBS copies) which then significantly delayed the arrangement of placements. This student was passed between a number of units, physically and electronically, often being referred to people and officers where they had already been. An international student reported, having just moved to the UK and starting his first year, contacting and chasing the registry, Finance Office, International Office, Academic Office and Student Services, to resolve and deal with a visa issue which had occured due to a processing error within the University. This student was not provided a single point of contact but had to contact 5 different members of University staff and ensure that information was shared from one to another, in order to resolve the situaiton. A process they described as overwhelming and which led to them seeking support from the counselling service for stress. We recognise that the implementation of the new student records system is evident here and should be factored in. However, the registration process above all others illustrates some of the challenges that students face in order to effectively communicate with the University. Understandably the University arranges its services by department, which makes sense from an institutional perspective. The student perspective is different, they do not see individual departments, they require an understandable process, consistent information and feedback, and a sense that they are making progress with their issue or task. 22% of students reported that they did not receive sufficient information to enrol in a timely manner. The open section of this question most commonly focussed on the problems with the module selection process. Many students reported that the lack of full information or the provision of missing or late information relating to modules meant that once term started and they had access to more complete information, they were unhappy with the modules they had selected during enrolment. 18% of respondents reported problems with submitting documents and information to the University. The main themes were documentation being lost and frustrations with systemic technical issues (such as qualifications not uploading properly or the frustration around changing personal details). The common thread in the responses where students reported dissatisfaction was a feeling that the student had to always be chasing the University to check progress and often finding that progress was not as expected. We note that CPC has recently approved a paper on establishing an online DBS service and we are hopeful that this will solve some of the issues that students have reported. Recommendations Enrolment is a core process which each student has to undertake. We accept that some studentsâ&#x20AC;&#x2122; needs are more complicated than others but it would seem from the feedback that current arrangements are not efficient or simple for students to navigate, particularly if they have an issue. That the University review the enrolment process (both for new and returning students) in order to ensure that the information is accurate and timely and that the process is effective and accessible. That the enrolment process should be designed around the student, not around the administrative unit structure of the University. Consideration should be given to providing additional seasonal resource to act as a central, proactive, point of contact to resolve enrolment issues. For the University to monitor and capture issues with enrolment on an annual basis for the purposes of review and development. However, too often students reported that either content wasn’t being uploaded, or what was being uploaded was not accessible easily. The most significant factor in terms of students’ experience of Moodle seems to be directly related to the enthusiasm and ability of staff to use the platform. There are a number of examples captured in our research where student experience of the platform is widely different on the same module featuring multiple lecturers. That the University completes the 2017-18 audit of ‘VLE Base-line standards’ and uses the information to enhance usage and engagement, solves access issues and identifies training and deavelopment needs. That the VLE Base-line standards should be promoted to, and accessible by, students in order to establish expectation. That teaching staff are asked to sign up to these standards in a similar way as students are required to promise to engage and access the platform. Placements Students who had taken part in a placement of longer than two weeks were asked a number of questions about their experiences. The majority (80%) of respondents were based in Carmarthen. They majority of respondents came from FEC with roughly half of those being from SWWCTE and the others being from the other schools, mainly SJI. More than half of the respondents (53%) felt that they had not received enough information at the start of the placement to enable them to prepare adequately. Student comments indicate a tight timescale relating to placement information with most students reporting that they received information between 1 day and 2 weeks before their placement began. In other cases people stated that they had had sufficient notice initially, but that the information had subsequently changed. These comments were reflective of all placement students, not just those in SWWCTE. Respondents were much more satisfied with the support and contact they received from the University during their placement (85%), and felt that the information they had received was accurate (75%). However, one respondent to the survey did state that they had been given the wrong placement entirely, a situation a number of students reported to us at the start of the year, which included a student teacher on a bridging week who was allocated a school who did not teach their subject. Students are much more satisfied with their interactions with their tutors, and with the preparation they received to help prepare them for the practical elements of their placements, including professional standards. Placement issues mostly relate to placement allocation and communication and secondary process such as signing off DBS checks â&#x20AC;&#x201C; specifically for issues relating to the DBS process we are hopeful that the recent approval of the online DBS service will make a positive impact. Ensure that placement allocation and communication is accurate and timely. That the University commit to issuing accurate timetables to all students at least a week before teaching starts in each term, and that this commitment is added to the student charter. That the enrolment process should be designed around the student, not around the departmental structure of the University. Consideration should be given to providing additional seasonal resource to act as a central, proactive, point of contact to resolve enrolment issues. That the Universityâ&#x20AC;&#x2122;s â&#x20AC;&#x2DC;VLE Base-line standardsâ&#x20AC;&#x2122; are used to measure and monitor Moodle use and identify training and development needs. That teaching staff are asked to sign up to these standards in a similar way as students are required to engage and access the platform. Programmes Lacking Statements Our recommendation is that associated costs are listed in programme publicity. The following programmes were not displaying cost information on our audit date (information correct as of 17th April 2018). This list is as exhaustive as possible, using the University website as the sole resource. DipHE Nursing Studies http://www.uwtsd.ac.uk/dip-he-nursing-studies-health/ HND Public Services http://www.uwtsd.ac.uk/hnd-public-services/ BA Public Services http://www.uwtsd.ac.uk/ba-public-services/ BSc Policing http://www.uwtsd.ac.uk/bsc-police-sciences/ At date of check, we could not find any public cost of study information available for any programmes run through the London or Birmingham campuses.